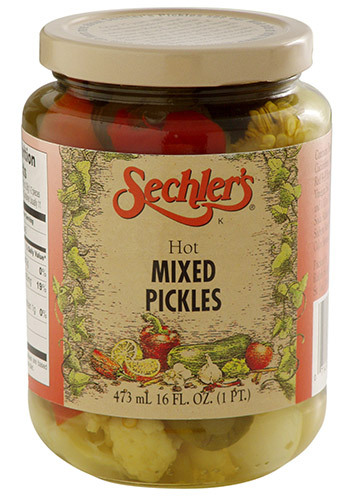 16 ounce Hot Mixed Pickles are cut length-wise with whole banana pepper slices, red bell pepper chunks, cauliflower florets,and pearl onions. An appealing and tasty addition to any relish tray. From rick of PERU, Indiana on 1/18/2018 . these are hard to find in stores been eating these for a long time now! best brand! From Mike of Summerfield, Florida on 7/8/2017 . Best hot mix out there! From Ken of Houston, Texas on 9/8/2016 . Excellent taste and heat. Great compliment to hot Hungarian peppers. I try to always have a couple of jars in the pantry at all times. From Anonymous of Ft Lauderdale , Florida on 8/13/2016 . Even though this is a smaller jar, I love the fact that you are getting more pickles and not all of the other veggies. They also have a perfect amount of heat. I will definitely be buying more! From Anonymous of Syosset , New York on 6/25/2016 .